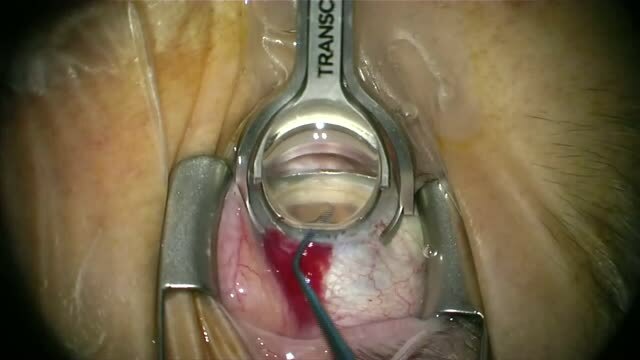 This is a short video demonstrating placement of an iStent and then verification of it's proper position in Schlemm's canal using BSS. After placement of the iStent the microscope is repositioned and all the viscoelastic in the eye is removed. The eye is then softened a bit by burping fluid out of the anterior chamber to allow the perilimbal aqueous veins to dilate. The eye is then firmed up with BSS through a paracentesis and if the iStent is properly placed in Schlemm's canal the surgeon will see blanching of these vessels in the region where the stent is placed due to the flow through the stent into Schelmm's canal. Note the blanching here at 11:00 to 1:00 when the eye is firmed up with BSS after softening it first. Ike Ahmed has demonstrated that with proper placement of the iStent, Trypan blue can be injected into to the anterior chamber and subsequently can be visualized traversing into the aqueous veins in his excellent videos. This short video shows a technique that can be used on any patient using just BSS to verify proper placement and patency of the system.